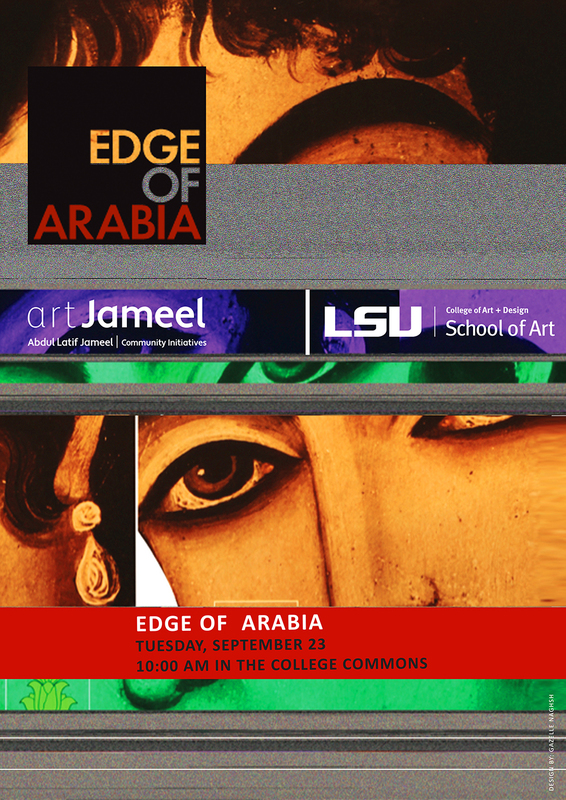 The LSU School of Art is hosting the Edge of Arabia US Tour at the LSU Design Building Commons on Tuesday, September 23, 2014. The cross-country, cross-cultural tour of Middle Eastern artists was launched in Houston in March 2014 by Edge of Arabia in partnership with Art Jameel and aims to connect artists, bridge communities, and inspire renewed collaboration across borders. The tour traveled to New York, Boston, and Washington, DC, before making the cross-country road trip to the west coast, stopping in Baton Rouge, Louisiana, along the way. The project allows grassroots encounters that link ideas and people across physical and psychological borders. At the event at LSU on September 23, participating artists will explore and communicate interconnected stories between the Middle East and the United States. All students and artistic communities as well as public are welcome to explore the vehicle and meet with artists during the trip. Participating artists include Ava Ansari, Sarah Abu Abdallah, and Stephen Stapleton. Ava Ansari is an artist, educator, and curator. She is the cofounder of The Back Room, a curatorial and pedagogical project that facilitates exchanges between artists and scholars in Iran and the US. She has presented work at Dixon Place, La Mama, Eyebeam, the AC Institute, and the Museum of Contemporary Art Santa Barbara, among other places. Her recent curatorial projects include Fixed Unknowns, Taymour Grahne Gallery, New York, 2014; I am Only a Reporter, Ardeshir Mohassess, Modern Section of Art Dubai, 2014; and A Call, a remote project with 80 performers between Tehran and New York with Wafaa Bilal, 2011. She has previously worked at Aperture Foundation, New York; Shirin Gallery, New York; Basement Gallery, Dubai; and Silk Road Gallery, Tehran. She currently works at the Edge of Arabia, where she serves as an associate curator and the manager of the EOA US Tour. She received her BA in public relations and journalism from Allameh Tabatabaei University in Tehran and her MA in art politics from the Tisch School of the Arts at New York University. SUBWAY from ava ansari on Vimeo. Sarah Abu Abdallah works primarily with video and film as a medium. She grew up in Qatif, Saudi Arabia, and is currently pursuing a master’s degree in digital media at the Rhode Island School of Design. Her recent exhibitions include Arab Contemporary in the Louisiana Museum of Modern Art in Denmark, Migrating Forms in New York City, the Serpentine Galleries 89plus Marathon in London, the 11th Sharjah Biennial in 2013, and Rhizoma in the 55th Venice Biennale in 2013. She contributed to the Arts and Culture in the Transformative Times festival by ArteEast in New York City and the Moving Image panel on video and film in Palazzo Grassi, Venice. 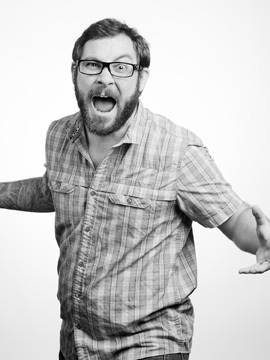 Stephen Stapleton is an artist, curator, and cofounder and director of Edge of Arabia. After encountering the artistic community in Abha, Saudi Arabia, during a journey across the Middle East in 2003, he founded the Offscreen Education Program and Edge of Arabia as platforms for cultural dialogue between the Middle East and Western world. He has published several books related to the Middle East, including Offscreen: Four Young Artists in the Middle East (Booth-Clibborn, 2004); Edge of Arabia (Offscreen Education, 2009); and Contemporary Art from Saudi Arabia. He has won several awards for his work in the field of intercultural education. Visit edgeofarabia.com for more information.